X-Force is a new product for training all muscle groups with their own body weight. With it you will be able to perform more than 60 exercises. Designed for users up to 350 lbs. In this review, we will review at the main advantages, training opportunities and difficulties that arise for users of this equipment. So let’s read Total Gym X-Force Review. This fitness equipment can easily fit into any interior. It looks quite good and it is easy to remove if necessary. At the same time, you will be able to perform an effective training at any time. It is totally easier to visit the gym. You save time and can study at any time. Total Gym is suitable for almost everyone, regardless of gender or age. The technique of performing exercises is easy to learn, and training is not traumatic. Ergonomic design allows you to train comfortably. The following specifications indicate the dimensions of the equipment in use. For storage and moving, you can easily fold the equipment and significantly reduce its size. I would like to say a few words about the brand. The entire product line of total Gym fitness equipment is of high quality and efficiency. Most of their products are the best-selling in the segment of fitness equipment for home. The manufacturer cares about the comfort of users and constantly improves the ergonomics of its products. The Total Gym X-Force comes with a good set of accessories to make it easier to use. It includes a set of pulleys and cables for various purposes. In the kit you will receive the ab crunch boards, ab crunch boards, dip bars. To protect the floor from damage there are two mats under the legs of the equipment. A total of 7-8 optional accessories. These components provide for use with this model of equipment and there is no guarantee that they can be used with other equipment. Such equipment is not common in gyms. Therefore, not every user can easily use Total Gym in training in a variety of ways. To make the use of this equipment easier, two training DVDs are included. They will allow immediately after the purchase and Assembly of this equipment to start training using a variety of exercises. The correct technique of the exercises will allow you to get more efficiency and prevent possible difficulties. The Assembly of Total Gym X-Force seems to be more complicated than it really is. Most people have the idea that this is complex equipment with a lot of accessories and attachments. Actually, You will need standard tools and some time. The rest will help you with detailed instructions. The ways of using additional accessories are intuitive. Total Gym X-Force User Manual. It shows the build process step by step. We recommend that you download it before the Assembly, read and only then begin the process. The equipment is supplied pre-assembled as far as possible. At the beginning of use is not necessary to hurry. Available accessories can confuse you. When assembling for storage, additional accessories must be removed. Do this once slowly and in the future you will not have difficulties. You will also need to adjust the height to your height. For all this, use the instructions. In the future, you will not have difficulties with the service. It is necessary to keep the equipment clean. The frame structure is made of durable material. Total Gym X-Force is quite stable. Extra stability the legs attach to the mats. There is a user weight limit of 350 lbs. This will be enough for most users. Pulleys, handles and back are also quite strong. At the same time they are convenient. Your training will be safe and comfortable. Using your own body weight you can train the following muscle groups: Chest, Back, Shoulders, Legs, Arms, Abs, Stretch. Training can take 20 to 30 minutes. This will be enough to maintain good physical shape. In total, you can perform about 60 exercises and their variations. Using accessories you can train different muscle groups. To train sitting or lying on the Board. Learn new exercises for you will be easier with video training. You can perform traction movements by training your arm and back muscles. By adjusting the height of the pulley you can use to train the legs and muscles of the press. It can be raised or lowered. In addition, by adjusting the angle of the Board, you can also create additional resistance. If it is inconvenient to view the DVD you can also use the manual and flip chart. They also date detailed information on training and nutrition program. An integrated approach will allow you to quickly get the desired result. Accessories will allow you to perform additional exercises focused on certain muscle groups. For example, Ab Crunch accessory allows you to perform abdominal exercises. Dip bars will provide additional opportunities for exercise and exercise the pectoral muscles, deltoid and triceps. Detailed information about the same equipment and about the manufacturer can be obtained on their official website – http://totalgymdirect.com/. We can confidently recommend NEW-Total Gym X-Force for home workouts. It will suit athletes of any level and will effectively burn calories, strengthen muscles. Best Price. The maximum price for Total Gym X-Force which we fixed in 2019 was about $400. At the moment, in the store, we are considering the cost was from $300 to $420. Guarantee. Most often, the terms and conditions of the warranty will not differ. Terms of delivery. This is one of the components of the total cost. In some cases, large stores delivery will be free. In this case, specify the delivery time – they may also vary. Alternatives. The segment of fitness equipment is rapidly replenished with new products. Since the release of this review, more functional models may appear. It is worth paying attention and making a comparison. #Q: HOW TO ASSEMBLE TOTAL GYM X FORCE? The build process is shown in detail in the user manual. You can download it from the link above and see. It shows the layout of the parts and describes the Assembly Sequence. #Q: WHAT IS THE DIFFERENCE BETWEEN TOTAL GYM 1600 AND X FORCE? #Q: WHAT IS THE HEIGHT OF TOTAL GYM X-FORCE? So, this equipment is one of the product line. 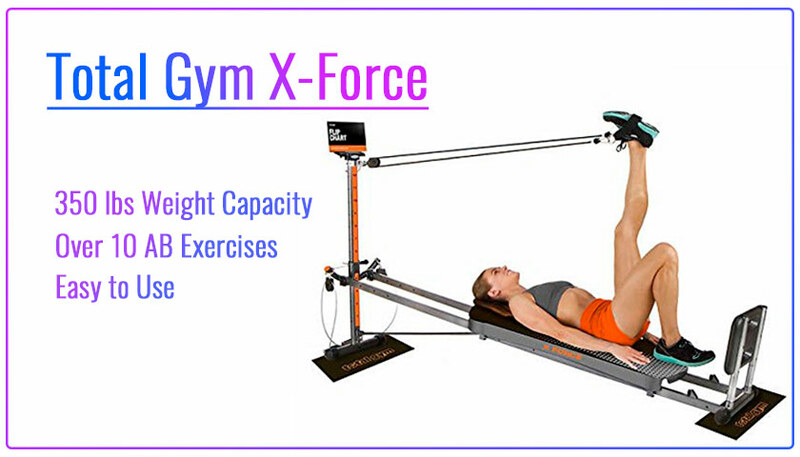 Model X-Force is of good quality, reliability and a wide range of possible exercises. The price is average in comparison with analogues. We can recommend you to pay attention to this model of Total Gym when choosing fitness equipment for home. Thank you for this Total Gym X-Force Review, but I have some doubts. Will there be a result in training only on this equipment? You will be able to perform a large set of exercises. This will effectively maintain good physical shape. But the more varied the training, the better the result. Therefore, we would recommend using Total Gym workout in combination with other exercises. Thank you for the quality review. How suitable is Total Gym for muscle building? This equipment in most cases will not provide opportunities to actively build muscle. It is designed to actively maintain good shape. I accidentally stumbled upon this article. It was useful for me to learn about the possibilities of Total Gym X-Force. Now I think to buy such equipment for training at home. Thanks for this post. Does the Total Gym X-Force easily fold and store like other many other total gyms? I really need something I can take out and put back immediately after use. Thanks! Yes, it fold up easy enough. I can understand that. After a hard workout, I don’t always have the desire to spend a lot of time folding equipment. Can I use the Total Gym weight bar with the X-Force ? It is possible to use weight bar for models 2000, 2200, 2500, 3000, 3000XL, XL, XLS, Electra, Super, FIT and FIT Signature Series. X-Force does not have such a possibility unfortunately.